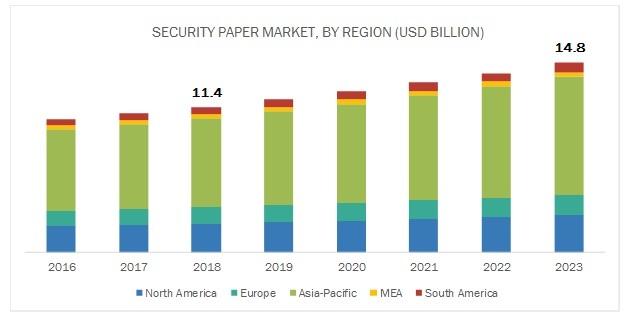 [156 Pages Report] The security paper market is projected to grow from USD 11.4 billion to reach USD 14.8 billion by 2023, at a CAGR of 5.42% from 2018 to 2023. The growth of this market is attributed to the rising incomes, infrastructure modernization, large population base, and cash-based payments. Further, an increase in the number of fraud and counterfeiting cases have boosted the demand for security papers across various applications. In terms of value and volume, the substrates segment is projected to lead the security paper market from 2018 to 2023. Based on components, the substrates segment is projected to lead the security paper market, in terms of value, from 2018 to 2023. Polymer substrate is one of the key elements used for manufacturing security paper. The long lifespan of the polymer has contributed to the growing demand for plastic in the manufacture of security papers. Hybrid security papers are another type of substrate, which are special papers with security features containing watermarks, security fibers, and threads, and are used in various types of security documents. Hybrid papers include photographic papers, polymer substrates, and fabric. Hybrid papers are luminescent in UV light and contain special supplements and chemical components, which prevent mechanical and chemical erasures and other types of forgery. In terms of value, the banknotes segment of the security paper market is projected to grow at the highest CAGR during the forecast period. Based on application, the banknotes segment of the security paper market is projected to grow at the highest CAGR, in terms of value, during the forecast period. The growth of this segment is attributed to the constant printing, circulation, and reprinting of banknotes, coupled with the rise in a number of cases of counterfeit notes, which are projected to drive the demand for security papers for banknotes. Moreover, the growth in tourism is projected to boost the demand for passports and visas, which in turn, is projected to drive the security paper market. Furthermore, due to the growing concerns toward national security, a number of countries are majorly focusing on developing highly secured ID cards, boosting the usage of security papers in identity cards. In terms of value, the Asia Pacific security paper market is projected to grow at the highest CAGR during the forecast period. The Asia Pacific security paper market is projected to grow at the highest CAGR from 2018 to 2023, in terms of value and volume. China is the largest country-wise market in the region and is projected to dominate the market in this region over the next five years. 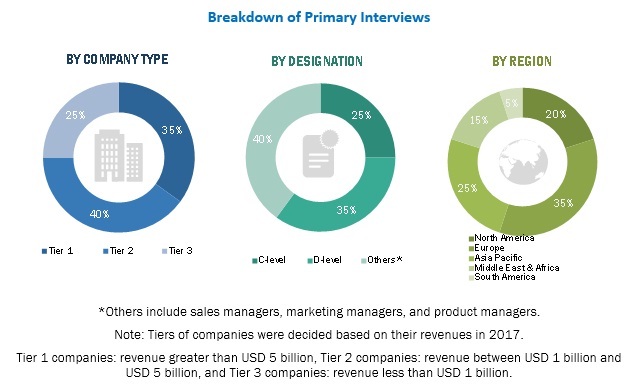 The growth of the security paper market in the Asia Pacific region is attributed to the strong demand for security features such as watermarks, holograms being embedded during the printing stage of banknotes, passports, and stamps, the growing tourism industry, economic stability, increasing incomes, and infrastructure. Furthermore, the growth of the security paper market in the region is also driven by the increasing demand for banknotes due to the population growth and cash-based economy in some countries such as India and Indonesia. High demand for security papers in the region is attributed to the increased spending on legal services such as documentation, litigation, and licensing. This factor, in turn, has boosted the demand for legal documents in the region. Increasing awareness among customers and companies about document security is projected to fuel the growth of the security paper market during the forecast period. Giesecke+Devrient (Germany), De La Rue plc (UK), Fedrigoni Group (Italy), Security Printing and Minting Corporation of India Limited (India), Real Casa de la Moneda (Spain), Security Paper Limited (Pakistan), Goznak (Russia), China Banknote Printing and Minting Corporation (China), Drewsen Spezialpapiere GmbH & Co. KG (Germany), and Document Security Systems (US) are the key players operating in the security paper market. Giesecke+Devrient, one of the leading players in the security paper market, which has a broad business portfolio and wide presence across the globe. This contributes toward its leading share in the security paper market. High revenue and adoption of strategic initiatives such as partnership, joint venture, contract, acquisition, and expansion have ensured its leading position in the market. For instance, Veridos, a subsidiary of Giesecke+Devrient, entered into a partnership with the Iraq Ministry of Interior with the aim to build a high-tech identity document factory in Baghdad, Iraq. The factory produces passports, electronic IDs, and security documents by providing over 100 local jobs. The company also focuses on adopting new technologies and machines, which help in increasing the plant capacity, thus adding to its revenue. In September 2018, Real Casa de la Moneda and the National Factory of Currency offered two series of stamps dedicated to cinema. These stamps were put into circulation from October 2018. In May 2018, SPMCIL signed a growth-oriented MOU (Memorandum of Understanding) with the Department of Economic Affairs (DEA) and Ministry of Finance for the year 2018-19. This MOU was based on the principle of growth in a globally competitive market. In January 2018, Giesecke+Devrient won a contract of USD 308.3 million in Egypt. The Central Bank of Egypt commissioned Giesecke+Devrient with the planning and development of an integral plant for the production and processing of banknotes in Egypt. What are the global trends in the security paper market? Would the market witness an increase or decline in the demand in the coming years? What is the estimated demand for different types of security paper products? What are the upcoming industry applications and trends for security paper? 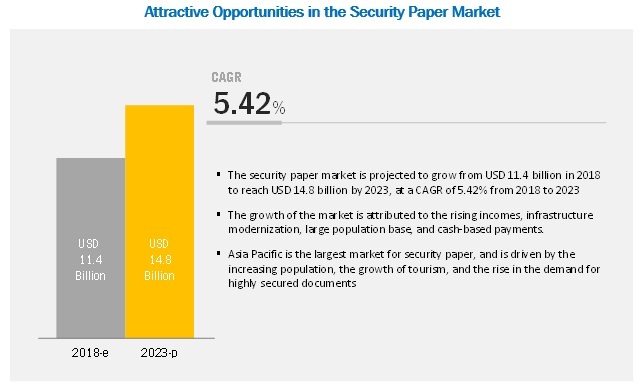 Who are the major players in the security paper market globally? The study involved four major activities for estimating the current global size of the security paper market. The exhaustive secondary research was carried out to collect information on the market, the peer market, and the parent market. The next step was to validate these findings, assumptions, and sizes with the industry experts across the value chain of security paper through primary research. Both, top-down and bottom-up approaches were employed to estimate the overall size of the security paper market. Thereafter, market breakdown and data triangulation procedures were used to estimate the size of different segments and subsegments of the market. In the secondary research process, various secondary sources such as Hoovers, Bloomberg BusinessWeek, and Dun & Bradstreet were referred to, so as to identify and collect information for this study on the security paper market. These secondary sources included annual reports, press releases & investor presentations of companies, white papers, certified publications, articles by recognized authors, gold & silver standard websites, food safety organizations, regulatory bodies, trade directories, and databases. After arriving at the overall market size from the estimation process explained above, the total market was split into several segments and subsegments. The data triangulation and market breakdown procedures were employed, wherever applicable to complete the overall market engineering process and arrive at the exact statistics for all segments and subsegments of the security paper market. The data was triangulated by studying various factors and trends from both, the demand- and supply-side. This research report categorizes the security paper market based on component, application, and region.